Follow our complete, step-by-step, photo illustrated recipe to make these delicious Chocolate Sour Cream Cupcakes. We’re working with our friends at OXO to make these cupcakes. Just add the frosting of your choice and enjoy. Printable recipe included. 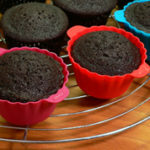 Chocolate Sour Cream Cupcakes recipe. I’ve been blessed numerous times here on Taste of Southern to work with the fine folks at OXO, makers of all kinds of great kitchen tools and various other housewares. And, I’m pleased to be working with them again on this one. 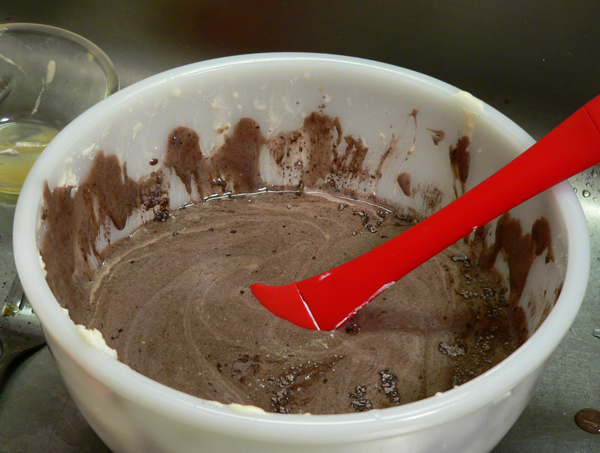 This is actually Part One of a two part recipe for making our Chocolate Sour Cream Cupcakes. Part two consists of the Vanilla Buttercream Frosting recipe, and how I used the tools supplied by OXO to make and decorate these very tasty cupcakes. Mama made lots of great cakes, but only once in awhile would she make cupcakes. They were always the basic yellow cake with chocolate frosting. Still, they were delicious, and I enjoyed each and every one. While I’ve always wanted to learn how to decorate cakes, I’ve just never devoted much time to the effort. When OXO offered to send me a Non-Stick Pro 12 Cup Muffin Pan, a dozen of their Silicone Baking Cups, and their Bakers Decorating Tool, in exchange for me testing and reviewing them, how could I resist? I was eager to get the chance to work with the Baker’s Decorating Tool the most. You’ll just have to check out my recipe for the Vanilla Buttercream frosting to see how I did. At first, I was just going to do the Buttercream recipe, but since I needed cupcakes, I decided to go ahead and do the complete, step-by-step, photo illustrated recipe for making them as well. I hope you’ll enjoy them. I used Hershey’s Special Dark Chocolate, but regular cocoa can be used if that’s what you have. I really liked the taste of these, and I can’t wait to add the Vanilla Buttercream frosting on top. Of course, you could use any flavor of frosting that you would prefer. Even chocolate. Please leave me a Comment in the section at the bottom of this recipe should you decide to give them a try. It’s always great to know when you try one of our recipes. It will only take a minute or two. So, if you’re ready to make some cupcakes, then let’s head to the kitchen, and… Let’s Get Cooking. 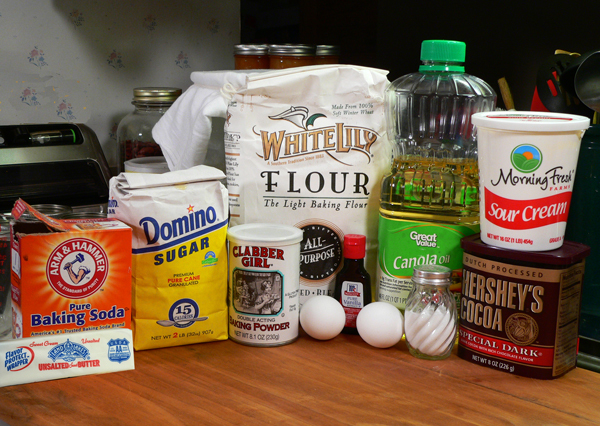 Chocolate Sour Cream Cupcakes: You’ll need these ingredients. 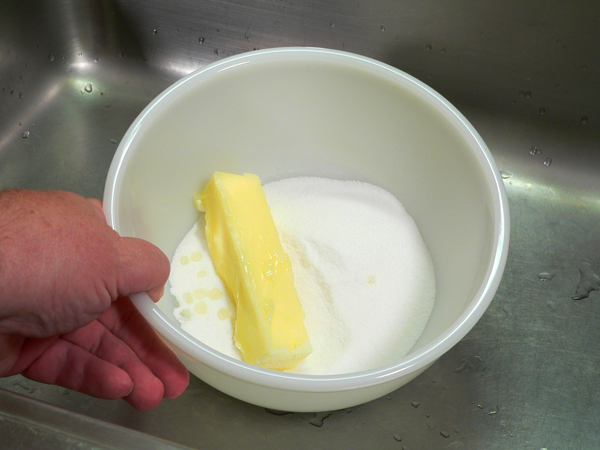 Place sugar and butter in a mixing bowl. Butter needs to be at room temperature before you start. 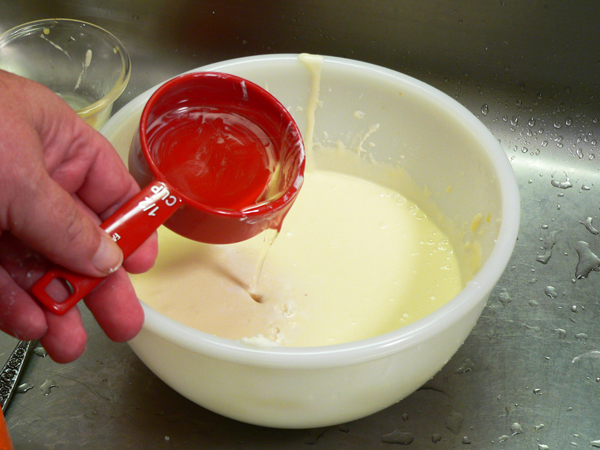 Use your mixer to cream the sugar and butter together until smooth and creamy. Scrape down the sides of the bowl as needed. Add the sour cream. Like the butter, the sour cream needs to be at room temperature before adding it. 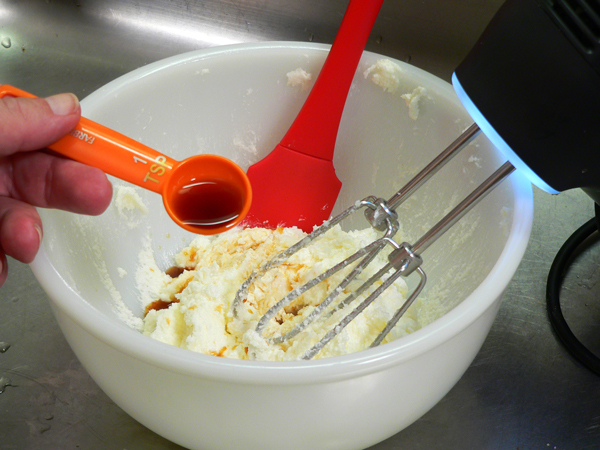 Combine everything together with your mixer until smooth. I always suggest that you crack your eggs, one at a time, in a small bowl before you add them to your recipes. This way, if you have any pieces of shell fall in, you can remove them a lot easier. Sometimes, you might not see any broken shell if you added it directly into the batter. I also like to break up the egg with a fork before adding it in. 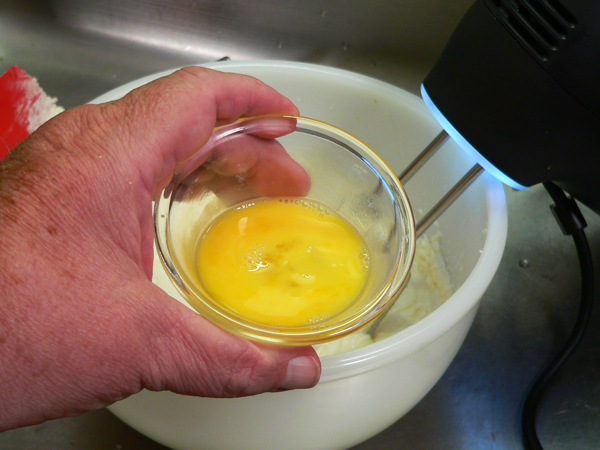 Add the eggs, one at a time, to the batter mix. 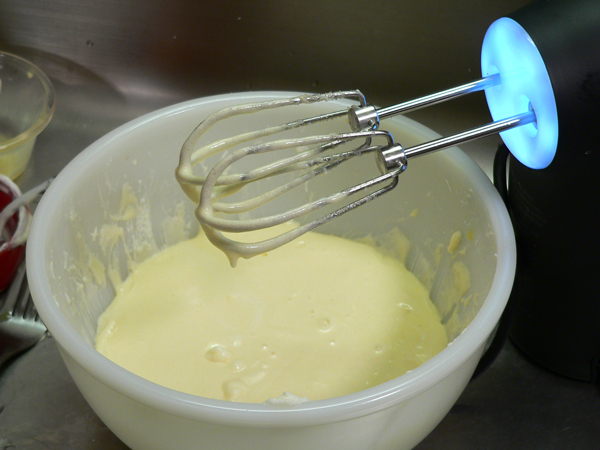 Use your mixer to blend this into the batter. 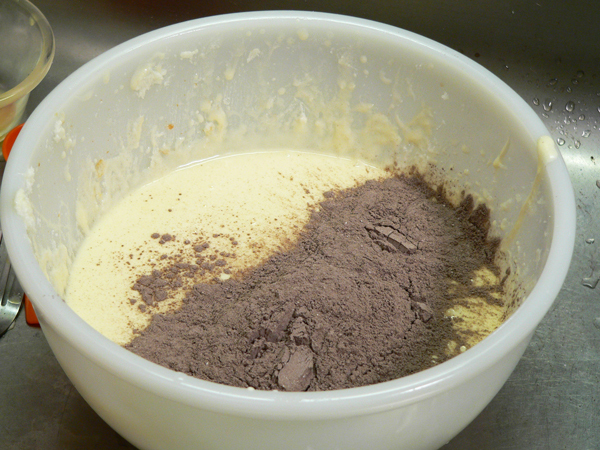 Mix the eggs into the batter until they are completely incorporated. Why yes, I do have a light on my mixer. This is my OXO hand mixer that I love working with. It can do some heavy duty mixing when needed. Mix everything together until it’s well combined. Set this aside for the moment. The batter is very “soupy” at this point so don’t be worried by that. In another bowl, add the flour. 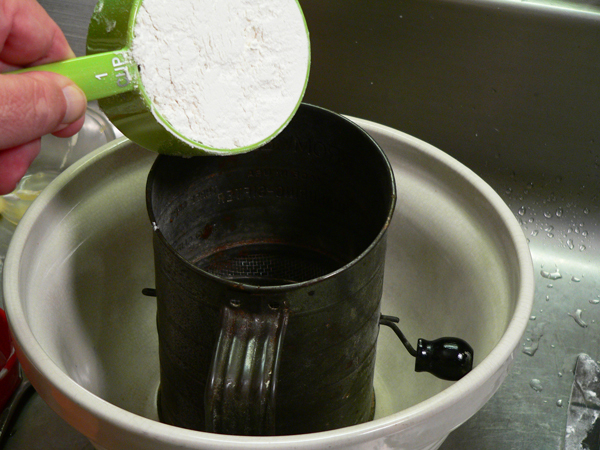 I like to add the flour to my sifter first. I’ll add all of the dry ingredients into the sifter, then sift them into the bowl. This old sifter belonged to my mom. It’s a family treasure for certain. Love it. I’m using a Dark Cocoa. Regular cocoa would work just as well. Just using what I had on hand. 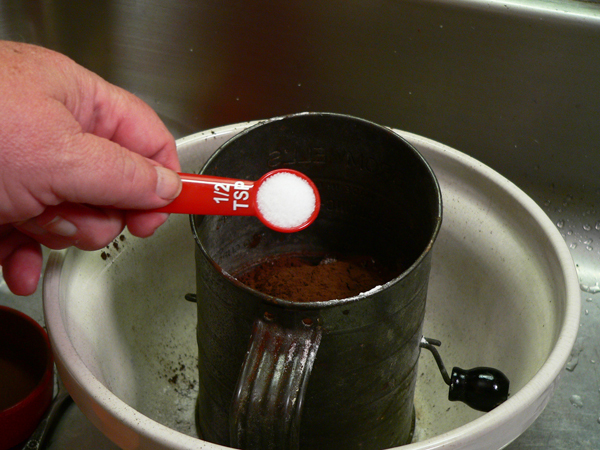 Of course, things got messy when I tried to dump the cocoa from the tin it was in into my measuring cup. Perhaps it would have been better to have spooned it into the measuring cup instead. Smile. I sifted all the dry ingredients into the mixing bowl. It wasn’t mixed together as well as I thought it needed to be, so I pulled out the wire whisk and whisked it together a bit more. 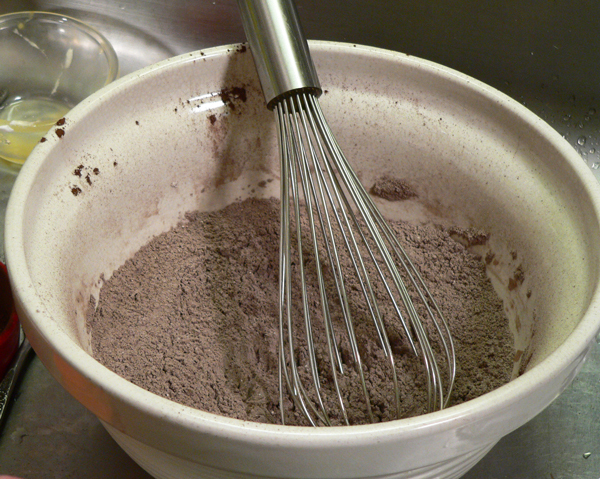 You could also just add all the dry ingredients into the bowl and whisk them together well if you don’t have the sifter. You just want to fluff up the flour and mix everything together very well. Place about one third of the dry ingredients into the wet ingredients. I used my hand mixer to mix the first amount of the flour mixture into the wet ingredients. Once I had it incorporated pretty good, I used a spatula to scrape down the sides of the bowl. 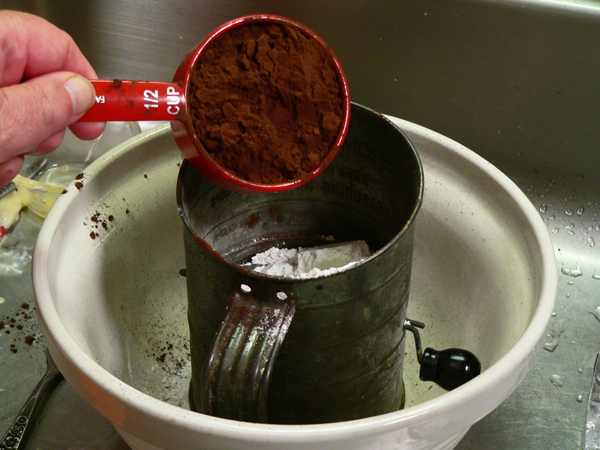 Repeat the process, adding another third of the dry ingredients into the wet. Mix just until incorporated, then add the last third of the dry ingredients. 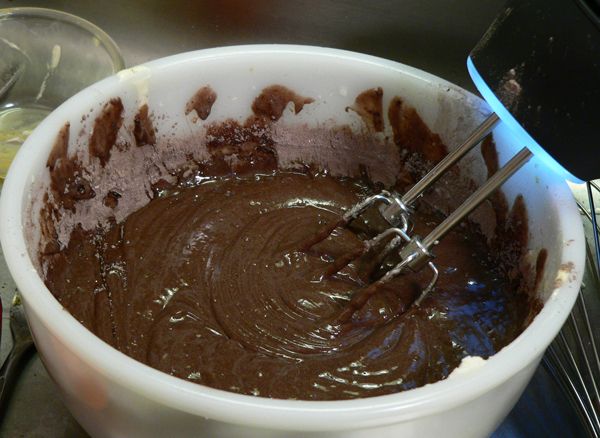 Do not over mix the batter at this point. 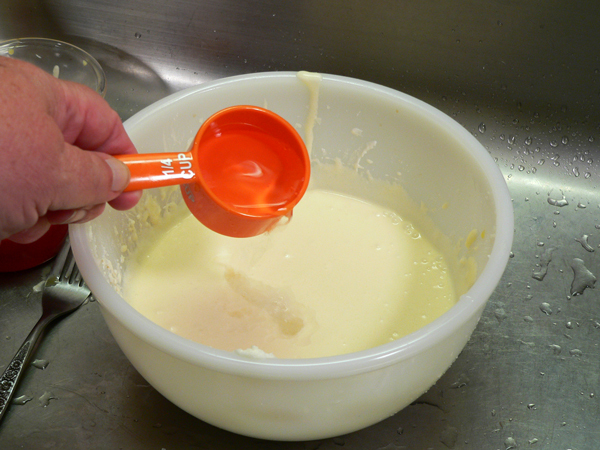 As you add the dry ingredients in, just mix it on a lower speed until it is fairly well mixed into the wet batter. 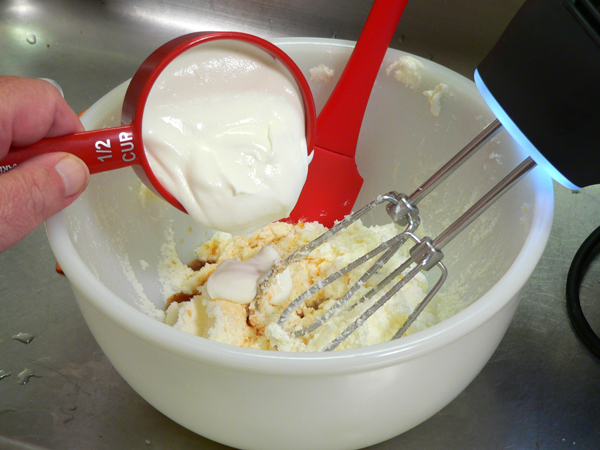 Finally, use the spatula once again to scrape down the sides of the bowl, and fold everything together. 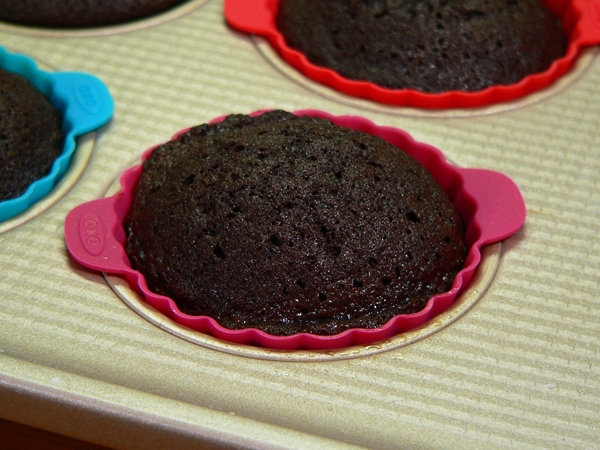 I’m using some of the OXO Silicone Baking Cups, but will also be using paper liners. 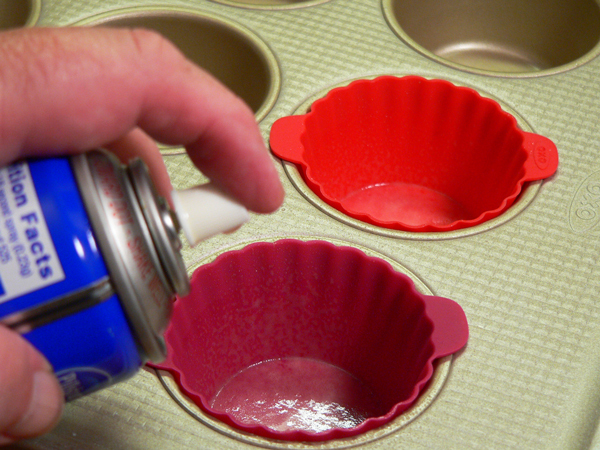 OXO suggests that the silicone cups be lightly sprayed in the bottom with cooking spray so the bottoms release easily. Fill all of the cups about two thirds full. 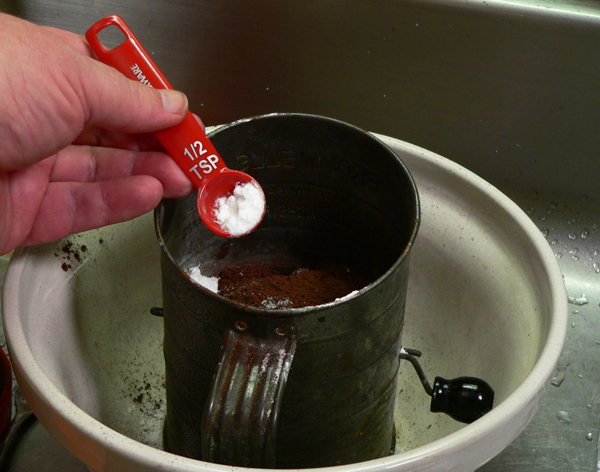 A large spoon, or a large ice cream scoop work well to fill the liner cups. Don’t over fill them and try to add the same amount to each cup. I had just enough batter to make 12 cupcakes. Notice the tabs on the OXO Silicone cups? 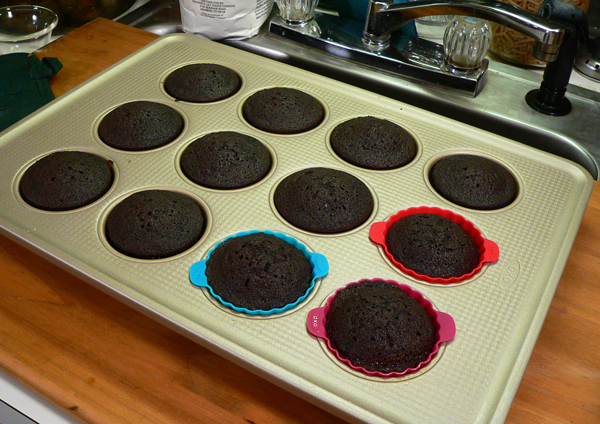 They make it super easy to lift the baked cupcakes out of the baking pan when they’re done. Place the baking pan into a oven preheated to 350F degrees. 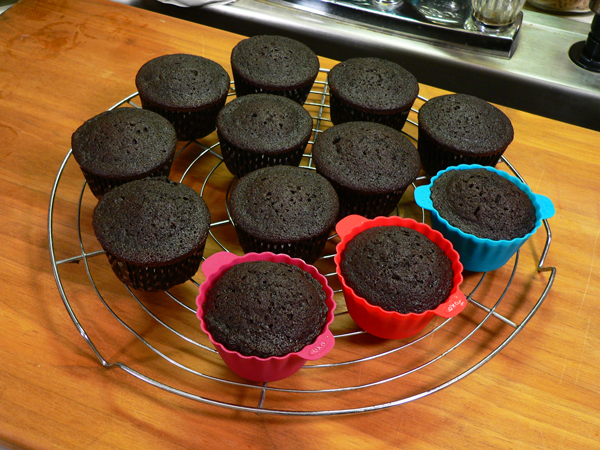 Bake the cupcakes for 10 minutes, then rotate the pan around so they bake more evenly. Check them after about 5 more minutes to see if they are done. Insert a wooden toothpick into the center of a couple of the cupcakes when they are about done. Pull the toothpick out. If it pulls out clean, the cupcakes are done. If you pull it out and it has a few crumbs clinging to it, then let the cupcakes bake a few minutes longer. Mine took a total of about 20 minutes to bake. Ovens vary, so keep a close eye on them as they finish baking. Remove the cupcakes from the oven when done. Let them cool in the baking pan for 5 minutes. After five minutes, remove the cupcakes from the baking pan and place them on a wire rack. Let the cupcakes cool completely before you try to add frosting. Frost the cupcakes as desired. Be sure to check out my Vanilla Buttercream Frosting recipe here on Taste of Southern for a great way to frost these Chocolate Sour Cream Cupcakes. You have lots of choices in frosting flavors to enhance these cupcakes. Still, they’re mighty tasty just as they are. I hope you enjoy them and would love to hear your Comments in the section below if you decided to bake them. Follow our complete, step-by-step, photo illustrated recipe to make these delicious Chocolate Sour Cream Cupcakes. We’re working with our friends at OXO to make these cupcakes. Just add the frosting of your choice and enjoy. Preheat oven to 350 degrees. Line cupcake pan with 12 liners. 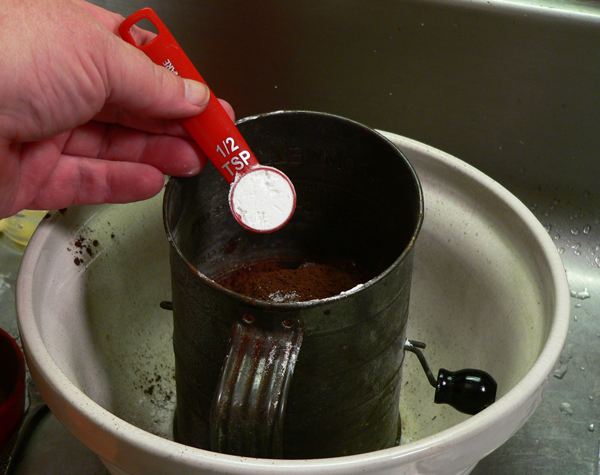 All ingredients should be at room temperature prior to mixing. In a large mixing bowl, add sugar. Add sour cream, mix until fully incorporated. Add eggs, one at a time. Scraping down bowl after each egg is added. Mix until all ingredients are fully incorporated. In another large mixing bowl, add the flour. 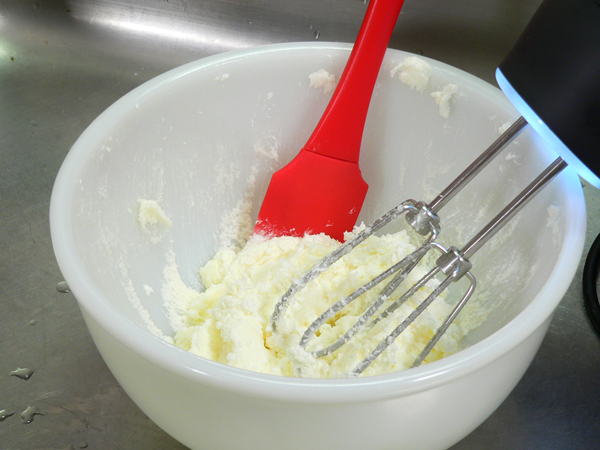 Whisk all the dry ingredients together well. Slowly add the flour mixture to the wet mixture, just until combined. Do not over mix. 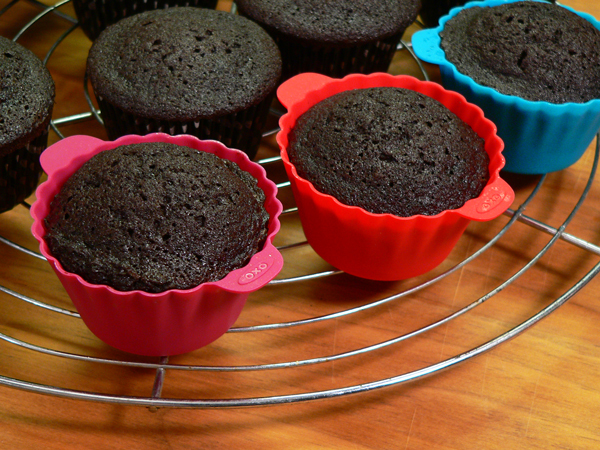 Fill each cupcake liner ¾ full. 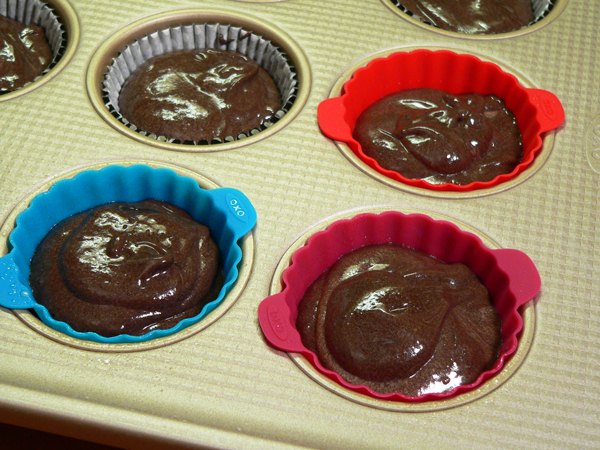 Bake for about 4 more minutes, and then test the cupcakes for doneness. Cakes are done when a toothpick inserted into the middle of the cake pulls out clean. Remove from oven. Let cupcakes cool in the pan for 5 minutes. Remove cupcakes from pan, place on a wire rack. Let cool completely before frosting. 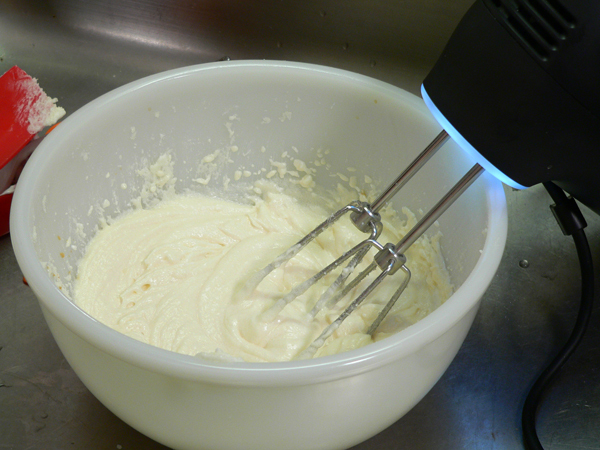 Be sure to check out our recipe for Vanilla Buttercream Frosting, also on Taste of Southern.com. Your Comments: What’s your favorite cupcake? Have you tried these? I thought your cupcakes look just fine and I like anything Chocolate, or my mom’s go to 7 minute frosting, it has a tangy taste. I love French Butter Creme frosting. These cupcakes sound so good. I would love the Cool Whip frosting on these chocolate sour cream cupcakes. They are my favorites! I had hip replacements surgery two weeks ago. But I’m getting around the house quite well. I made your chocolate cupcakes yesterday. I substituted drained whole milk yogurt for the sour cream, and brewed coffee for the water. But I was too tired to make frosting. The cupcakes were moist and delicious without it. Chocolate just what I need to heal quickly. Thanks!!! 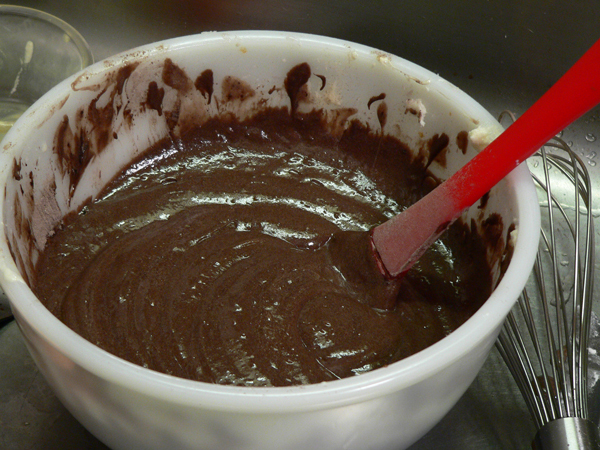 Chocolate icing. Always chocolate icing. Definitely peanut butter. Always make extra for dipping -everything in!! Any cupcake with ginger or other spices. Gingerbread,spice cake or carrot cake batter.And cream cheese icing. I love to take chocolate chips and let them melt on warm cupcakes and then spread to use as icing. I love chocolate cupcakes, and yours sound so good. I would use my favorite frosting from Crisco for Classic White Frosting. Pinned. Thanks. Hello Steve! I will try these this weekend. Thanks. I love your newsletter. My favorite icing is butter cream! My favorite frosting for cupcakes is good old fashioned buttercream.